The Town of West Point provides water to resident and the Hampton Roads Sanitation District provides sewer services. Both are billed through the Town of West Point and can be paid online by clicking the button below or by calling (804) 843-4363, mailing to P.O. Box 152, West Point, VA 23181, or at Town Hall - 329 6th Street. Where do I pay my local taxes? Town of West Point Real Estate and Personal Property taxes can be paid online by clicking the button below or by calling (804) 843-4363, mailing to P.O. Box 152, West Point, VA 23181, or at Town Hall - 329 6th Street. How do I report an erosion problem? Contact the Community Development Department at (804) 843-3563 or come to Town Hall - 329 6th Street. How do I report a missing street sign? If you observe a missing street sign contact the Virginia Department of Transportation at (800)367-7623. How do I report an issue in a town park? If there are issues to report involving a town park please contact Town Hall at (804) 843-3330 or come to 329 6th Street to report it in person. How do I report a street light is out? 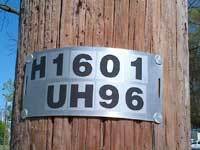 In order to report a street light that is not working or damaged in some way you will need the identification number off of the pole prior to contacting Town Hall at (804) 843-3330 or coming to 329 6th Street to report it in person. Please be prepared to give a street address and the pole number when you are calling to report a pole light out. You will find a row of metal numbers and letters on the pole. That is the number Dominion Power will need to locate the correct pole. How do I view the floodplain information for my property? For more information please contact Holly N. McGowan, Community Development Director at (804) 843-3563 or email her at hmcgowan@west-point.va.us. If you would like to request a Bulk Item Pick-up please call (804) 843-4363 or come to Town Hall at 329 6th Street to report it in person. I want to get Utilities Turned On? For information on how to set up water & sewer service / trash cart / recycle bin accounts. TV, phone and internet provider. How can I obtain a Town document? If you would like assistance in searching for official town documents please contact Town Hall at (804) 843-3330 or coming to 329 6th Street to report it in person.